A one line entry in the 1878 Langley Directory of San Francisco announces the appearance of a J. P. Schardin. The entry reads, simply, " Schardin, Joseph P. (Lang & Co.), dwl Morton House". The Morton House was run by William G. Graham "proptr." and was located at 119 Post St. in "the City". It was one of thousands of low cost rooming houses located in San Francisco at that time. 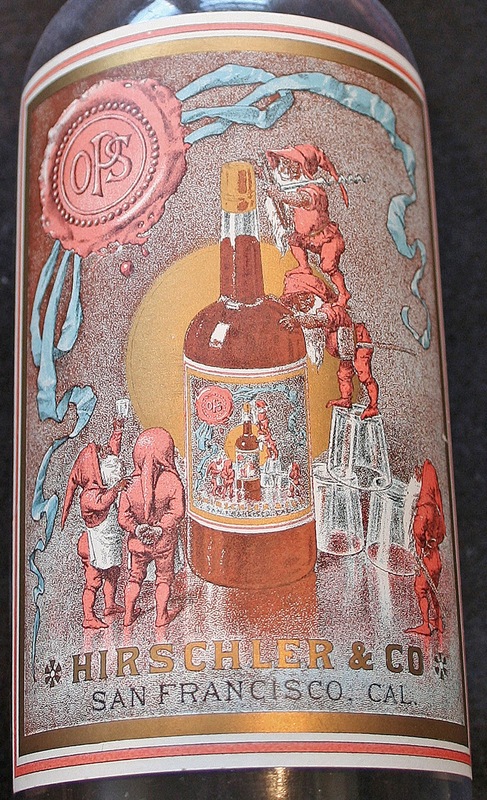 Lang & Co. (Schardin was the & Co.) were wholesale dealers in foreign wines and liquors. Their wholesale warehouse was located at 8 Morton St. 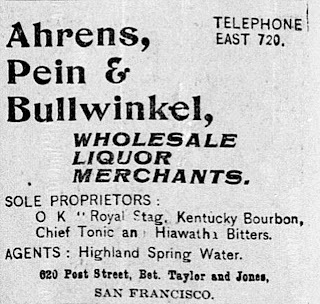 They also had a retail "liquor saloon" at 325 Sansome. Schardin appears again in the 1879 directory, this time his residence is listed as 210 DuPont St.; (DuPont St. was later renamed Grant Ave.). Schardin is still with Lang and all appears status quo with the exception that "foreign" is dropped from the Lang & Co. wine and liquor listing. In 1880, Schardin is no longer listed as being part of Lang & Co. Instead, he is shown as residing at 22 Geary St. while maintaining an office on his own at the 210 DuPont address that was formerly his residence. Oddly enough, Lang is also shown as occupying the same DuPont St. address at the same time, only with a new partner. A change occurs in 1881 in that Schardin relocates to 31 DuPont and takes on a partner by the name of Frederick Loy. There is no longer a mention of a separate retail location; both being run out of the same "store front". The 1882 - 1886 directories are a carbon copy of one another. Status Quo. An 1884 inventory of the business doesn't look too promising. Wine worth thirty cents a gallon / whiskey a buck a gallon. And the horse, musta been a real thoroughbred valued at $15~... Total value of the entire company; a whopping $3225~. Real high rollers, eh? But, in 1887, it appears that Schardin finally hit his stride. A new residence, a relocation of the business to 16 - 18 Grant Avenue (beneath the City of Paris - San Francisco's most prestigious department store before the turn of the century - the building was one of the few to survive the 1906 Earthquake). 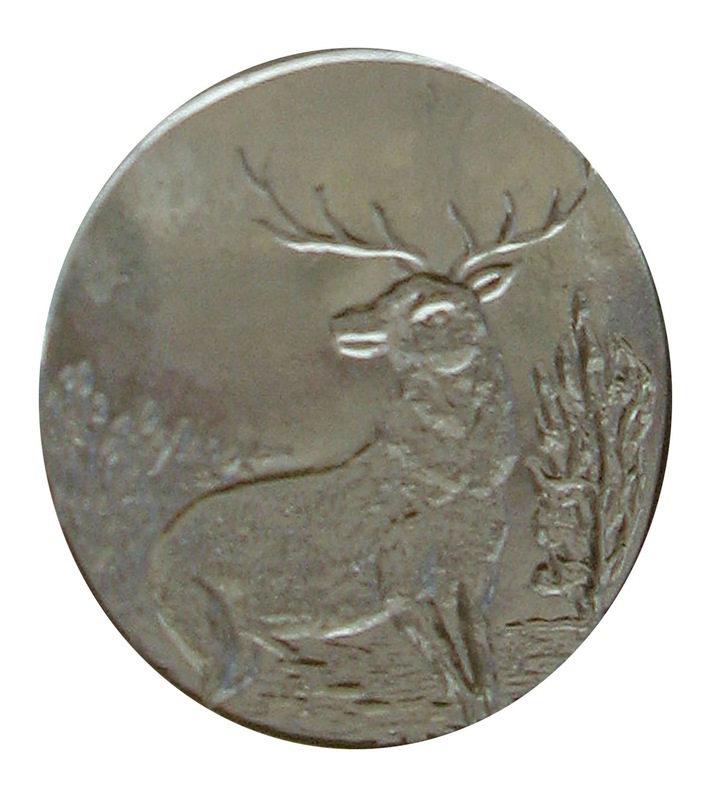 And something else that set me back on my heels; Schardin, and not Ahrens Pein & Bullwinkle, had the Sole Agency for the Royal Stag brand! And to top that off, he is also listed as the sole agent for "Chief Bitters". For the next four years Schardin maintains the same listing in the directories. All in bold type; business was good! And then, without warning, in 1891, the sky fell in. J. P. Schardin died suddenly and unexpectedly at 10:35 PM, Wednesday January 30, 1891. The obituary that appeared in the San Francisco Morning Call spoke volumes about his character and integrity. A ship without a captain, J. P. Schardin & Co. remained in business during the rest of 1891, and into 1892, operated by his estate, while the search for a successor continued. It appears that the stars finally aligned and in 1893 yet another entry in the City Directory appeared. 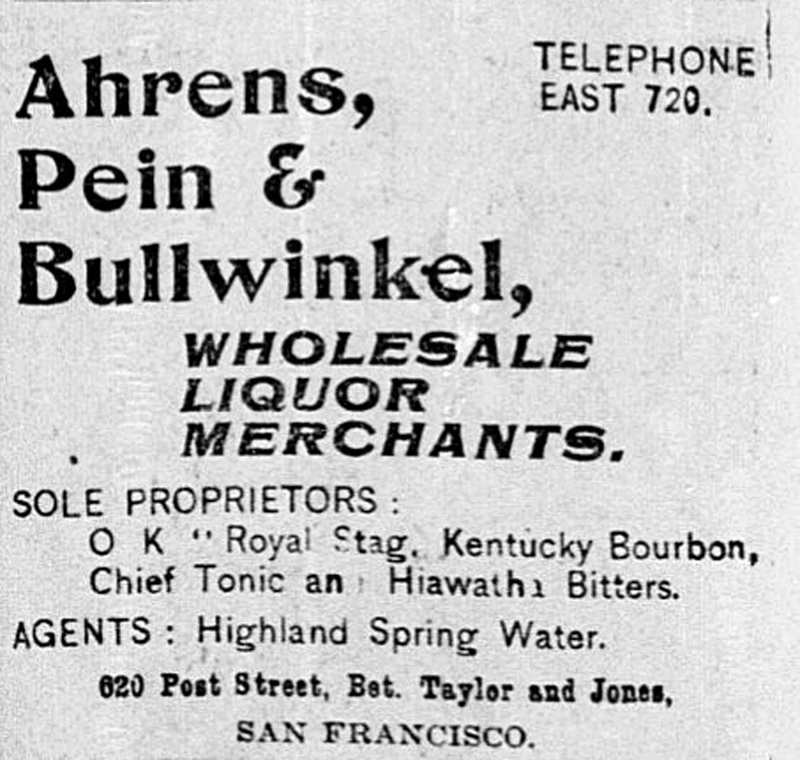 Yep, good ol' Ahrens, Pein & Bullwinkel are now listed as the sole agents for Royal Stag brand of whiskey. much in the form of advertising until the late 90's. Sure, the obligatory one line insert into the City Directory appears like clockwork every year but the newspaper ads didn't start popping up until around 1898. And then, they saturated the classifieds. 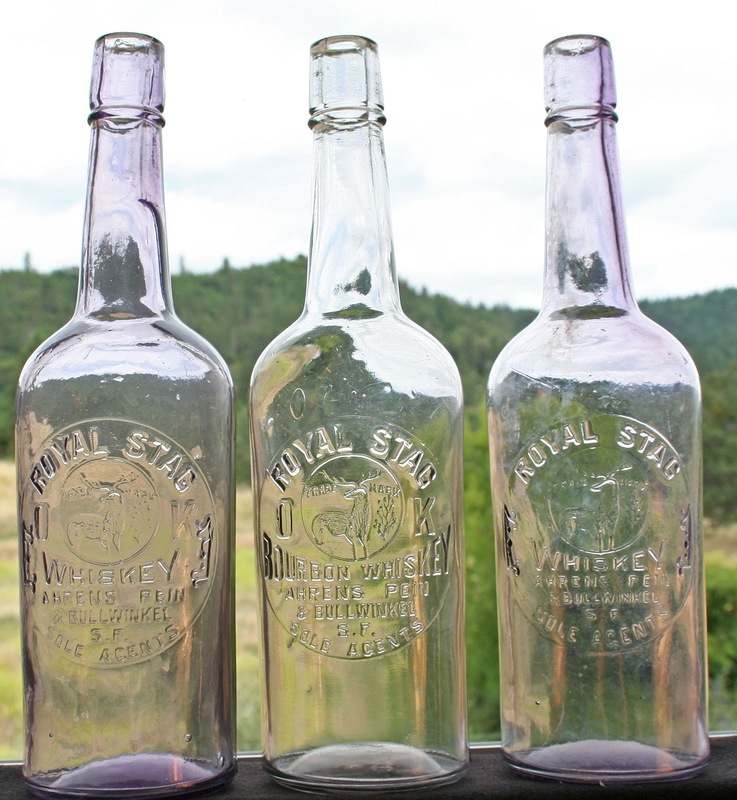 Best guess is that this is also about the time that they started bottling whiskey in embossed bottles instead of the paper labeled slicks that they'd been relying on. We can account for four different embossing variants used to package the whiskey; although only two molds were actually made (the variations are simply two molds being modified over time). One of the molds bears the base mark 32H (NO - not Holt!) and as such, can be attributed to Abramson Heunisch and date ca. 1902. 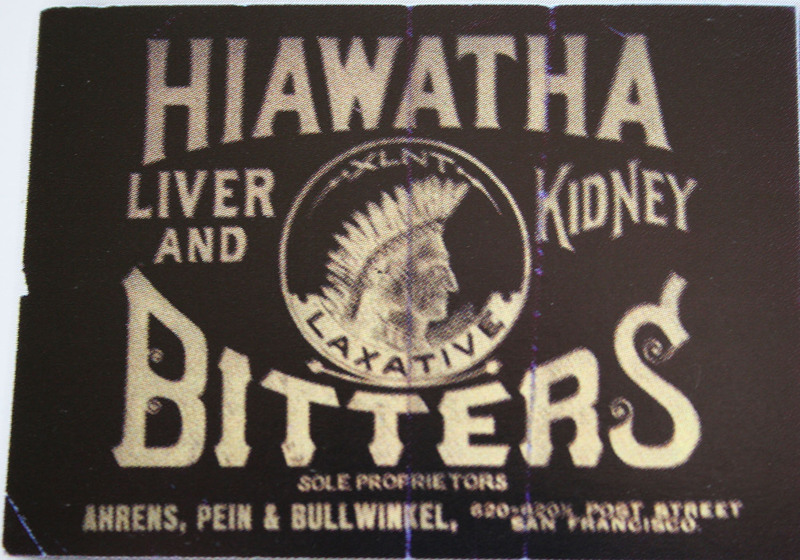 The Chief and Hiawatha brands of bitters / tonic bottled by Ahrens, Pein & Bullwinkel were both paper labeled only as no whole or damaged embossed examples have ever surfaced. 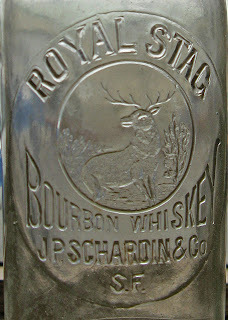 And speaking of embossed... Wouldn't it be amazing if an embossed Royal Stag Whiskey from J. P. Schardin & Co. were to surface some day? Many years ago in Jacksonville, a friend of mine found a bottle sticking out of the dirt down the hill from the stable up at the "Hanna House" off of Pine St. Turns out, there wasn't just "a bottle", it was a dump and the bottles were packed into the hill like cordwood. It was, as they say, "stacked". Judge Hiero K. Hanna, the owner of the Hanna House, was a circuit court judge here in town back in the day and presided in the massive Italianate Brick Courthouse. And he lived in his home on the hill, just a few blocks from the courthouse for many, many years; from the 1870's on past the turn of the century. Hiero K. (H.K.) Hanna was born in Steuben County. New York, May 22, 1832. He attended the public school until he was fourteen years old, when he entered a dry goods store as salesman. In 1848 he immigrated to Wayne County, Ohio, and found employment in the Recorder's office. 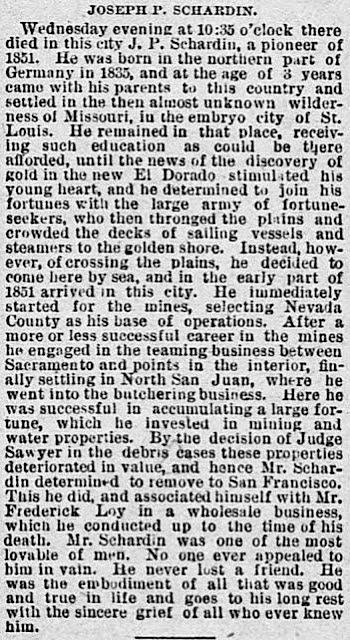 Succumbing to the Western fever, he came to California in 1850 and at once struck out for the gold fields of the interior. 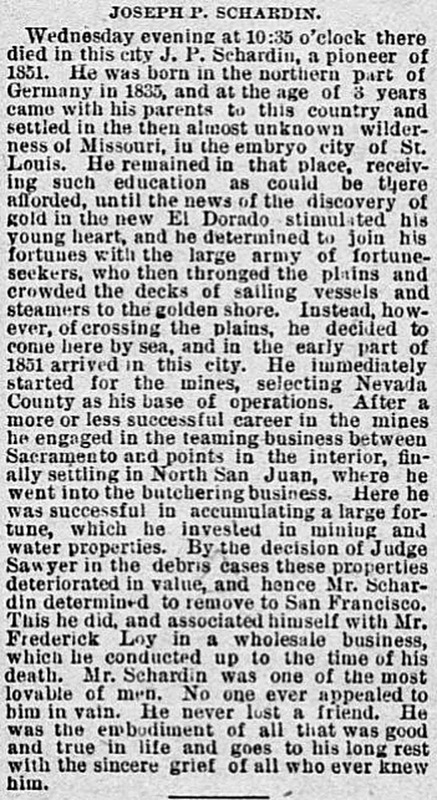 He remained in California for about eight years, and working his way northward, we find him a resident of Josephine County in 1858, still following his avocation as a miner while devoting his spare time to preparation for a thorough course in the study of law. He was admitted to the bar and he moved to Jacksonville in 1872. He was re-elected in 1874 and again in 1876. In 1878 Governor Thayer appointed Judge Hanna Circuit Judge of the First Judicial District. In 1880 he was nominated and elected as his own successor, and he continued to occupy the same high and honorable position until his death on July 25, 1910. He was, obviously, successful. There is probably no member of the legal profession better or more favorably known throughout Southern Oregon that H. K. Hanna. His enterprise and integrity have made for him friends among all classes of society, and his name is a synonym for honesty and industry. He is a man of rare worth and intelligence. He is remarkably clear-headed and grasps with readiness any knotty problem of law, and is quick in forming an opinion and rendering a decision. None are more independent than himself, and neither fear nor favor control his acts in either public or private life. He is married and has three children, one of which is adopted. He has won a warm corner in the hearts of the people of Southern Oregon, and we bespeak for him many years of usefulness. He was active in civics, being a past Master Workman of A. O. U. W. "ANCIENT ORDER OF UNITED WORKMEN", and Past Sachem of I. O. E. M. (no record of this organization found) and a Member of the Oregon Historical Society. For some reason, around the turn of the century, for a short period of time, he decided to dispose of his trash on the side hill instead of taking advantage of the Chinee used bottle and rag man that lived just north, over in Chinatown. Apparently, he liked to drink; a lot. And some of the other items recovered during the dig raised a lot more questions. The first bottle that popped out was a Kellogg's whiskey. Cameline was marketed as a cosmetic with the obvious target customer being the ladies by promising to "impart a healthful, natural complexion" by "softening and beautifying the complexion". Along with the Kellogg's and Cameline by the pile, a large quantity of odd looking hard rubber tubes around 4" long, with holes in the side - sealed on one end and with a fitting on the other, began appearing. First just one here and one there, and then by the score. Huh? Day turned into evening, and he'd hardly made a dent in the dump. Back at sunup, the previous days rewards were repeated. This time quite a bit in the way of Chinese pottery made it's appearance, along with a broken Acoma Indian pottery bowl. These finds in turn gave way to another hoard of Wakelee's which was followed up by another few dozen whole and broken Kellogg's. Sadly, all good things come to an end and the dump finally pinched out. Besides the mountain of rusted metal, common household bottles and Chinese stuff, there were the funny black hard rubber things, a couple dozen intact Camelines and several dozen broken Kellogg's along with 26 intact ones, some with labels still legible. And then there was that broken Acoma Indian pottery bowl. The Chinee pottery is probably easy to explain. Chinatown was large, just down the hill from the Hanna place and the pottery was everywhere. It no doubt made good planters and flower vases. But why the broken Indian bowl? Aha, the railroad came to the Rogue Valley in 1887. Newspapers reports of the day mention H. K. Hanna and family boarding the train and touring the Southwest. The bowl, no doubt a souvenir of the trip, was a fond memento of this trip until it was broken and discarded around the turn of the century. 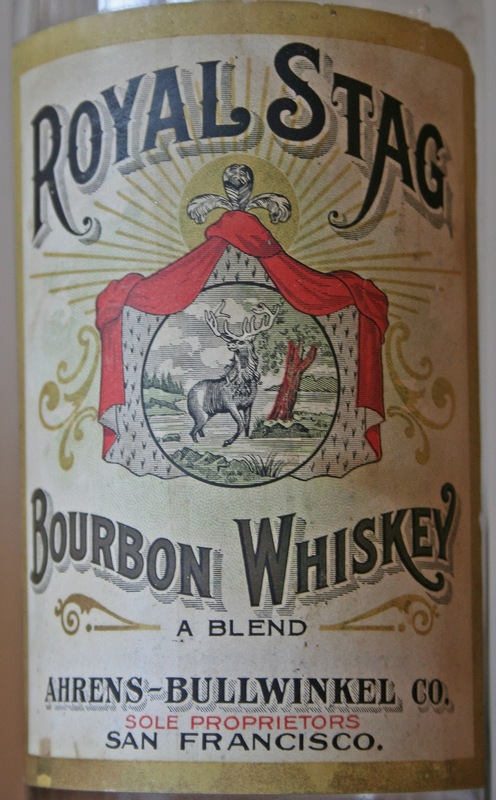 Why so much in the way of Kellogg's whiskey in such a short window of time, and where did it come from? We're not talking about a bottle or two; we're talking cases and cases! A couple of ideas come to mind. One possibility is that the pressure of the job had begun to wear on Judge Hanna and this was his way of coping with it. As far as the source of the Kellogg's; the photo shows the front of the Table Rock Saloon. It was a mere two blocks from home. Notice the sign? Back to the quantity; maybe there was a different reason for that much whiskey, one that tied into those funny little hard rubber tubes and the piles of Cameline bottles. We dug a pit in back of a "home for soiled doves" down south years ago. Along with cosmetic bottles and piles of champagne, wine and liquor bottles, we also found quantities of the " hard rubber tubes". Later, we found out that they were part of a "kit" that was invaluable in keeping the soiled doves from smelling, uh - soiled. And with that, one has to wonder if Judge Hanna wasn't presiding over more than just court. Nah, not Judge Hanna~ Or? 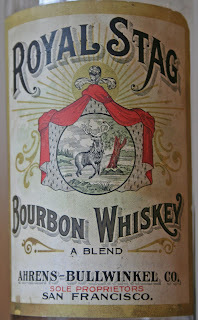 You may ask yourself, "what does a weasel have in common with a website dedicated to western whiskey bottles?". A valid question. And the obvious comes to mind; both start with a "W". mammals forming the genus Mustela of the Mustelidae family. They are small, active predators, long and slender with short legs. (informal) An escape clause; a clause in a legal contract permitting one of the parties to escape ("weasel out of") its obligations under some circumstances. And that's the direction we're headed; weasel clauses and how they apply to insurance. A few years back I inquired about coverage to supplement my homeowners insurance as it related to my bottle collection. I carry an antique rider on my homeowners, but it has a huge deductable and a specific policy written by my primary carrier, just to cover the whiskies, bitters and cathedral food collections, was out of our budget. I'd spoken with a couple of friends about an insurance company that specializes in covering antique collections. Both said that I should check out "Collectibles Insurance" as their rates were impossible to beat anywhere else. I felt comfortable that I'd covered my bases in advance and their coverage sounded like a great value. I paid the premium and a couple of weeks later, received the policy. All looked good. And so there I sat, fat, dumb and happy. I think the operative word was dumb (or at the very least, gullible). December 2012 saw my first "insured" loss. A rare variant of the Crown Distilleries mini disappeared from my table at a west coast show. The theft was reported to the show chairman, along with other thefts that occurred at this show and announcements were made over the PA system. We're not talking a lot of money here. Scarce, but not terribly high dollar. Still, I figured that I'd turn the claim in. After all, that's why I pay my premiums. And so I filled out the claim form and forwarded it to Collectibles Insurance for reimbursement. What happened next came out of the blue. I received the following email from the claims department; "Please note that we have a copy of the information provided to Collectibles. We understand that you are a Collector and not a Dealer; however, once you rent a sales table at a show, the items you are selling are considered "Dealer Stock". As a Collector, your policy will only cover and incidental sale of an unwanted item or a duplicate as the policy is not meant to assume the additional risk of a Collectibles Show." This flew in the face of what I'd been told originally by their sales department. Pop goes the weasel! No amount of logic or counter arguments made any difference. Collectibles Insurance refused to make good despite what I'd originally been told. They lied to drum up business and then turned down a valid claim after they banked the premium. Yesterday, as a tribute to the past year, I strolled around the property watching snowflakes drift lazily downward. It was a quiet end to an otherwise turbulent 2012. Good riddance I say. Out with the old and in with the new. In my search for a little Victorian artwork to head this article, I stumbled across a piece that really struck my fancy. 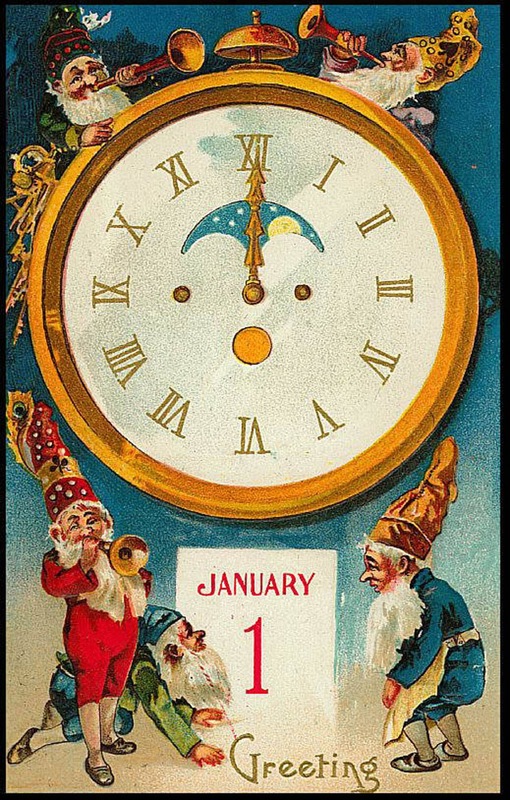 The tiny elves surrounding the clock really set the tone. Imagination? 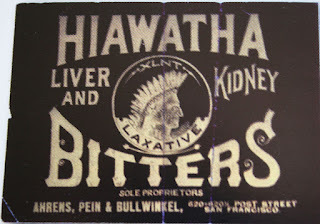 Or just a good swig of patent medicine... Whatever the inspiration, turn of the century artwork is fascinating to me. And (segway...) the imaginative artwork wasn't just limited to greeting cards. Whiskey labels often embodied the same creative juices. 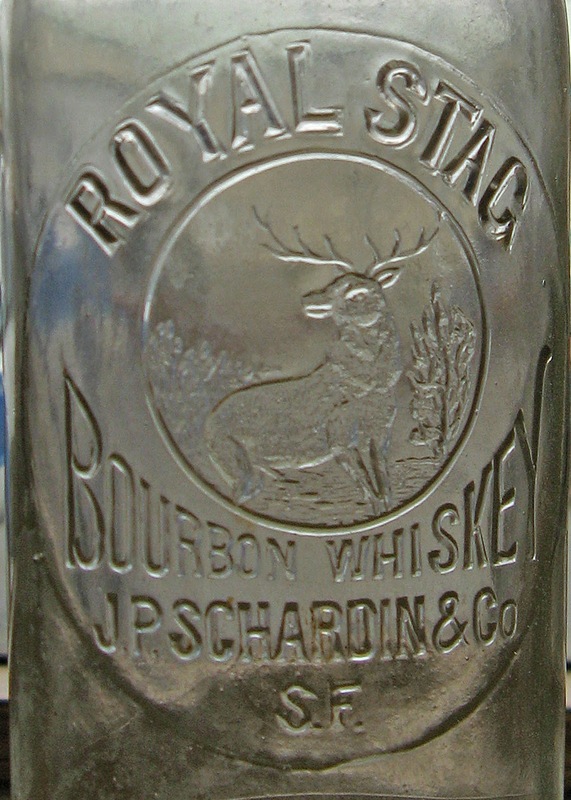 Without a doubt, my favorite label graces a clear tooled top embossed cylinder that contained whiskey sold by Hirschler & Co. of San Francisco. And coincidentally, or maybe not, elves also figure prominently in this theme.